I built the entire temple from scratch in Bryce, mostly using Boolean primitives, in order to get the "correct" (realistic) setting for the final image. As a result, you can see portions of the temple in the reflection off of the brushed silver chalice. The various torch lights tended to complement each other nicely and you can almost tell which torches are closest to the priest by the shadows they cast. The stained glass windows are 95% transparent Bryce terrains, similar to those in "Look There". 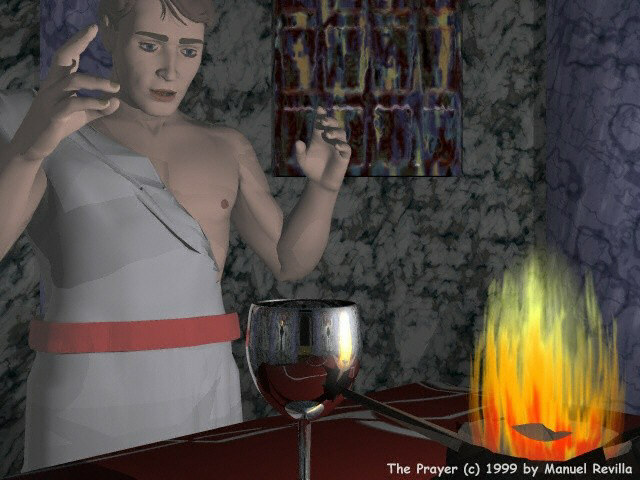 The Prayer is copyright 1999 by Manuel Revilla, all rights reserved.